The Stored Solar Stove Project fits into the iSEE research themes of Energy Transitions and Climate Solutions. “We are working on the so-called Global Cooking Problem. Three billion people — nearly half the world’s population — still cook using solid fuels and that causes over 4 million deaths per year. That’s more than malaria, tuberculosis, and HIV/AIDS combined. “The earth receives more solar energy every hour than civilization uses in an entire year. And so we want to use some of that free, clean energy. “But we are developing systems to concentrate, collect, store, and then recover solar thermal energy at high temperatures — near flame temperatures, and that’s key for replacing fire cooking. Another key: Storing the solar heat so you can cook later — and in a different location — is essential. You have to be able to cook at night or even the next day or even several days later for this technology to be widely adopted. 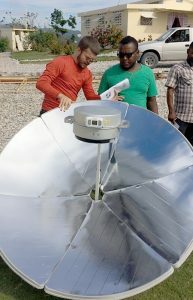 Sun Buckets Chief Technical Officer Matt Alonso explains the dish charging process to staff in Haiti. Matthew Alonso completed his Ph.D. in Agricultural and Biological Engineering in May 2018 with his work on Sun Buckets storage materials, and Samantha Lindgren won a prestigious Link Energy Fellowship for 2018-20 as one of three chosen among 118 applicants. Lindgren’s project is titled “The Role of Namibian Youth in the Advancement of Sustainable Energy,” and she will receive $29,500 a year for her continued Ph.D. work with Sun Buckets. The group reached an agreement with the Indian Oil Corp. to sell 10 prototypes and field test in India. “We hope that this is the first stage of a multi-stage project with India’s largest energy company,” PI Bruce Elliott-Litchfield said. Sun Buckets sold eight prototypes to campus Dining Services for use in the Lincoln Avenue Residence Hall’s dining hall “Field of Greens,” again with hopes that this is the first stage of a multi-stage project. In August 2018, Sun Buckets will send a team to field test and demonstrate prototypes in the UNHCR Kakuma Refugee Camp in northern Kenya as one of 23 selected seed projects that would receive grants of up to $250,000 each over a maximum of 24 months from the U.S. Agency for International Development (USAID) to support the validation and testing of new approaches. That same month, the same thing will be going on in Somaliland, Somalia. Sun Buckets continues to operate a successful field trial in Les Cayes, Haiti. A patent application was submitted May 28, 2017, with claims for the product and the process used to make Sun Buckets. Team members have met with three fabricators based in Illinois to get quotes for manufacturing 100 units. The bids will help the team better understand production costs and help prepare for delivery of the first commercial units. Team member Matthew Alonso is working with a professional welder to develop automated welding of the inner vessel, a critical part of the fabrication process. Sun Buckets is working with Underwriters Laboratory for independent safety testing. The team is also exploring several partnership options with organizations that can facilitate marketing, distribution, fabrication, and financing. Team members from Sun Buckets, the Stored Solar Stove startup company, earned four awards totaling $100,000 in May 2017 at the Clean Energy Trust Challenge in Chicago. Sun Buckets was awarded the ComEd Female Founder award ($20,000), the Hanley Family Foundation award ($20,000), the Power Clean Cities award ($20,000), and $40,000 from the Clean Energy Trust’s discretionary fund. Clean Energy Trust funds and grows early stage clean energy startups in the Midwest through direct investment and venture development. According to its news release, since 2011, Clean Energy Trust has invested in 34 startups across the Midwest. Clean Energy Trust Challenge companies have raised an additional $112 million in funding and created more than 300 new jobs. To learn more, visit cleanenergytrust.org. Samantha Lindgren of Sun Buckets accepts the 2016 Navigator Award from Ira Berman of Gulfstream®. Student team members of Sun Buckets — the startup company launched out of iSEE’s Stored Solar Stove project — are the recipients of The Ocean Exchange’s 2016 Gulfstream® Navigator Award. Presented each year at The Ocean Exchange’s Annual Event, this $100,000 award honors an outstanding innovation that demonstrates positive impact on the environment, economies, and health while respecting cultures around the world and has applications across multiple industries. A means to quickly recover the stored energy from the “Sun Bucket” vessel for cooking and other uses. A new way to seal the vessel and ensuring safe operation. A prototype that keeps the vessel in the focal point of the charging dish, thereby reducing charge times by 25-40%. Testing on a tracking mechanism to maintain focus on the sun throughout the day. New contacts (and new testing of the Sun Buckets system and cooking) at Navajo Tech University in Crownpoint, N.M., Climate Healers in India and Navajo Nation; LSM NGO in Haiti; and an Environmental Education Center in Namibia. A new cooking blog by team member Samantha Lindgren (photo at right). A connection with the Green Restaurant Association to explore domestic markets. Continued data processing toward construction of solar mapping, total global potential, and prime starter locations. Congratulations to the students who are working on the iSEE-funded Stored Solar Stove Project for earning a $5,000 Best Energy Specific Venture Award at the 2016 Cozad New Venture Competition on campus. The award, announced April 28, 2016, recognized the team for having the most promising energy-related startup — now known as Sun Buckets Inc.
More on the Cozad Awards can be found on the Technology Entrepreneur Center website. In addition, congratulations to Stored Solar Stove team member Matthew Alonso, a Ph.D. Candidate in Agricultural and Biological Engineering, who was a finalist and runner-up for the annual Illinois Innovation Prize. In Spring 2015, Ph.D. graduate student Matthew Alonso and undergraduates Sid Madhulbalan and Blake Banks continued to test candidate materials for storing solar energy. When any material is left in the sun it gets warm — but not warm enough to cook on necessarily. To replicate the feel of cooking over fire (the most dominant type of cooking in developing countries), a solar storage material must gather large amounts of energy from sunlight and then release that energy evenly at high temperature when taken out of the sun and into the home. So far, the team has has the greatest success with certain types of salt blocks. After a summer’s worth of work, the students have been able to achieve a consistent boil time of less than five minutes for 1 liter of water. They’ve also been able to cook meals — their specialty is naan bread — on prototype designs. From left: Original Stored Solar Stove team members Matthew Alonso, Ndu Egekeze, Tami Bond, Bruce Elliott-Litchfield, Madhu Viswanathan, and Joe Bradley. Bruce Elliott-Litchfield, Emeritus Professor of Agricultural and Biological Engineering and Sun Buckets Chief Executive Officer. His departmental page. Tami Bond, Professor of Civil and Environmental Engineering. Her departmental page. Her Center for Applied Collaboration on Human Environments (CACHE) page. Her lab page. Madhu Viswanathan, Professor of Business. His departmental page. Joe Bradley, Teaching Associate at IEFX-Illinois Engineering First-Year Experience and Sun Buckets Chief Financial Officer. His office page. Front row, from left: Students who participated in 2016 on the Stored Solar Stove project included Samantha Lindgren, Emily Floess, Catherine Zhou. Back row: Blake Banks, Keilin Jahnke, Matthew Alonso. Samantha Lindgren, Ph.D. Candidate in Agricultural and Biological Engineering and Sun Buckets Advisor. Read more about Sam and her work >>> Visit her Cooking with Sun Buckets blog. During Spring 2018, two MechSE 470 senior design teams worked on Sun Buckets projects. The MechSE Senior Design Team #19 of Spring 2016 helped make improvements to the Sun Bucket parabolic dish and prototyped a tracking system. Viswanathan’s class, BADM 532 “Sustainable Product and Market Development for Subsistence Marketplaces,” lent a helping hand on the project during the 2014-15 and ’15-’16 academic years. Read bios of the student 2015-16 team. Presentation: Conference papers. Alonso, M.; Floess, E. Solar Cookers International Conference, Goraj, Vadodara, Gujarat, India, January 2017.